Ranjit Singh was in every way as remarkable a man as his contemporaries, Napoleon and Mohammed Ali. From the status of petty chieftain he rose to become the most powerful Indian ruler of his time. His empire extended from Tibet to the deserts of Sindh and from the Khyber Pass to the Sutlej. His army was one of the most powerful of the time in Asia and was the first Indian force in a thousand years to stem the tides of invasion from the north-west frontiers of Hindustan. This is the first detailed biography of the first and only Sikh ruler of the Punjab by a Sikh writer who has devoted many years of his life to research on Sikh history. In this classic work Khushwant Singh presents Ranjit Singh as he really was. Based on Persian, Punjabi and English sources and drawing upon the diaries and accounts of European travellers like Moorcroft, Sir Alexander Burne, Masson, Fane and Emily Eden, this is a memorable account of the pageantry and brilliance of the Sikh kingdom at the height of its power, and a lively portrait of one of the most colourful character in Indian history. Khushwant Singh is India's best-known writer and columnist. He has been founder-editor of Yojana, and editor of the illustrated weekly of India, the National Herald and the Hindustan Times. He is also the author of several books which include the novels Train to Pakistan, I Shall Not Hear the Nightingale, Delhi, The Company of Women and Burial at Sea; the classic two-volume A History of the Sikhs; and a number of translations and non-fiction books on Sikh religion and culture, Delhi , nature, current affairs and Urdu poetry. His autobiography, Truth, Love and a Little Malice, was published in 2002. Khushwant Singh was Member of Parilament from 1980 to 1986. He was awarded the Padma Bhushan in 1974, but returned the decoration in 1984 in protest against the storming of the Golden Temple by the Indian Army. In 2007, he was awarded the Padma Vibhushan. The story is apocryphal. But it continues to be told by the Punjabis to this day because it has the answer to the question why Ranjit Singh was able to unite Punjabi Mussulmans, Hindus and Sikhs and create the one and only independent kingdom in the history of the Punjab. 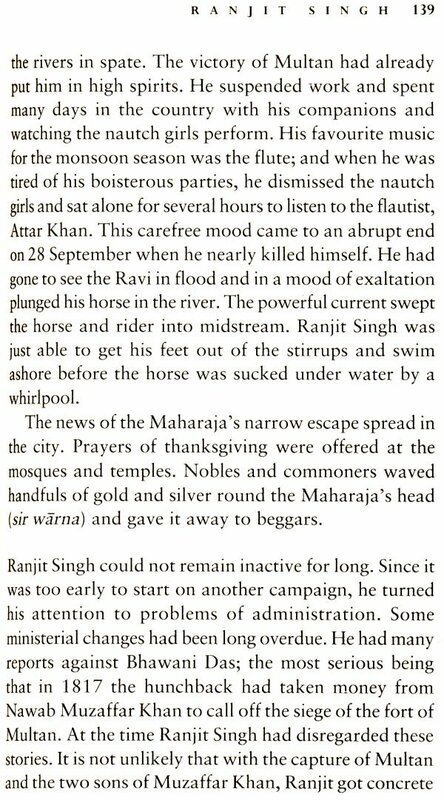 Another anecdote, equally apocryphal and even more popular, illustrates the second reason why Ranjit Singh succeeded in the face of heavy odds: his single-minded pursuit of power. It is said that once his Muslim wife, Mohran, remarked on his ugliness-he was dark, pitted with smallpox and blind of one eye ('exactly like an old mouse with grey whiskers and one eye'-Emily Eden), 'Where was your Highness when God was distributing beauty?' 'I had gone to find myself a kingdom,' replied the monarch. Ranjit Singh has been poorly served by his biographers. Hindu and Sikh admirers deified him as a virtuous man and a selfless patriot. This academic apotheosis reduced a full-blooded man and an astute politician to an anaemic saint and a simple-minded nationalist. Muslim historians were unduly harsh in describing him as an avaricious freebooter. English writers, who took their material largely from Muslim sources, portrayed him as a cunning man (the cliche often used is 'wily oriental'), devoid of moral considerations, whose only redeeming feature was his friendship with the English. They were not only not averse to picking up any gossip they could (every oriental court has always been a whispering gallery of rumours), but also gave them currency by incorporating them in works of history. In recent years monographs on different aspects of Ranjit Singh's government have been produced under the auspices of departments of history in some Indian universities. These are mostly catalogues of known facts put in chronological order without any attempt to explain them in terms of historical movements. This method of treatment makes the meteoric rise of Ranjit Singh and the equally meteoric collapse of his kingdom appear as freaks of history instead of as the culmination of an important historical movement. Just as a tide seems deceptively still to those who watch it from the shore, so did the swift undercurrent of Punjabi nationalism pass unnoticed by people who did not fathom the depths beneath the swell on which the Sikhs led by Ranjit Singh rode to power. In the same way, the fall of the Sikh kingdom was not simply due to misfortune in the field of battle but, as a wave spends itself on the sands when its driving force is gone, it was the petering out of a movement whose life force was spent and which had lost its leader.